Pan fried salmon recipes are top of my list for fast weeknight meals. You’ll get the perfect crispy skin and tender salmon every time with this recipe. Serve this easy keto recipe up in just over 20 minutes. I guarantee you’ll be adding this to your regular spring/summer meal plan! If the jalapeño salsa is too spicy for the kids, split the recipe in half and only add jalapeño to one half. Or serve the chopped jalapeño separately on the table to be added there. This avocado salsa can be served with any seafood or piece of protein such as beef, pork or chicken. It also makes a lovely accompaniment to grilled meats, seafood or just as a side dish. It is perfect for low-carb, ketogenic and gluten-free diets with 5g of net carbs per serve. Start by mixing together all of the salsa ingredients to in a small bowl. Set aside. Pat the salmon dry with a paper towel. Make sure to get the skin very dry. Drizzle the salmon with olive oil and generously salt the skin to help it get crispy. Place a large skillet over medium-high heat and get it so that its ripping hot. Add the salmon, skin side down, and cook for 3 minutes, pressing it down with a spatula so that the skin becomes flat against the pan. Carefully flip the salmon and cook for another 2 minutes, or until it is cooked through. 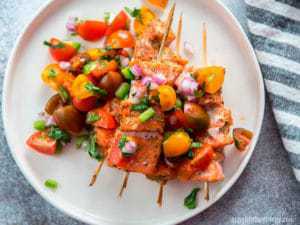 Serve the salmon topped with salsa and garnished with cilantro. For extra crispy skin, pat the skin dry and let it sit on a plate in your fridge with the skin-side up for 2 hours. This will dry it out even more. Too spicy for the kids? If you don’t like spice, omit the jalapeño in the salsa. Or split the salsa recipe in half and only add jalapeño to one half. Alternatively, place the chopped jalapeño in a bowl on the table for people to serve themselves. 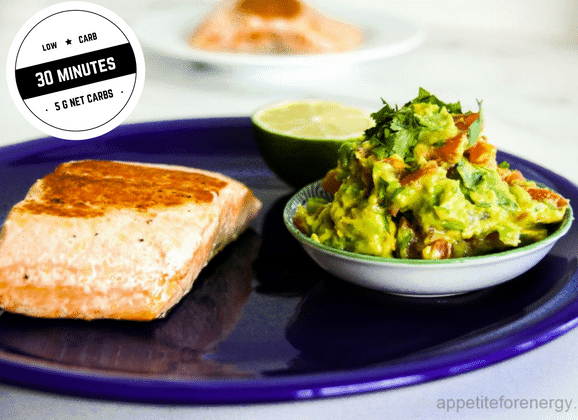 HOW DO YOU GET CRISPY SKIN ON PAN-FRIED SALMON? The key to getting a crispy salmon skin is to make sure it is totally dry. You can do this by patting it with a paper towel or letting it sit out, uncovered in the fridge for a couple of hours. The other key is to generously salt the skin. This helps get it nice and crispy and prevents sticking. HOW DO I COOK SALMON IN THE OVEN? 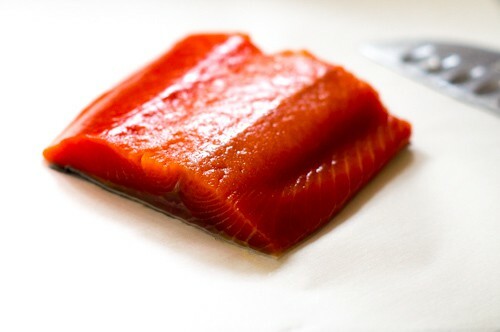 To make salmon in the oven, bake it at 325°F (160°c) for 20-25 minutes, depending on thickness. Baking it at a lower temperature makes the salmon extra tender. IS IT OK TO EAT THE SKIN ON SALMON? Yes! 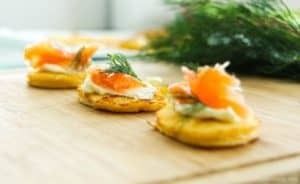 In fact, the salmon skin is actually the most nutritious part of the salmon and contains the highest amount omega-3 fats. Pan-fried salmon creates a lovely, crispy skin which is delicious to eat. 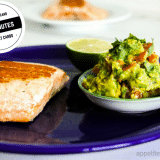 This dish combines Mexican flavors with the richness of salmon and finishes with a spicy kick from the jalapenos. It's bursting with flavor and low-carb, high fat goodness and the whole meal is ready in just over 20 minutes. First, make the salsa by placing all ingredients in a small bowl and mixing together. Set aside. Place a fry-pan over medium-high heat. Pat the salmon dry with paper towel and place on a plate. Drizzle the salmon with the olive oil and turn to coat each side of the fish. Generously salt the skin. This helps the skin to crisp up and stop it sticking to the pan. Once pan is very hot, cook the salmon skin side down for 3 minutes, then turn and cook for a further 2 minutes or until done to your liking. 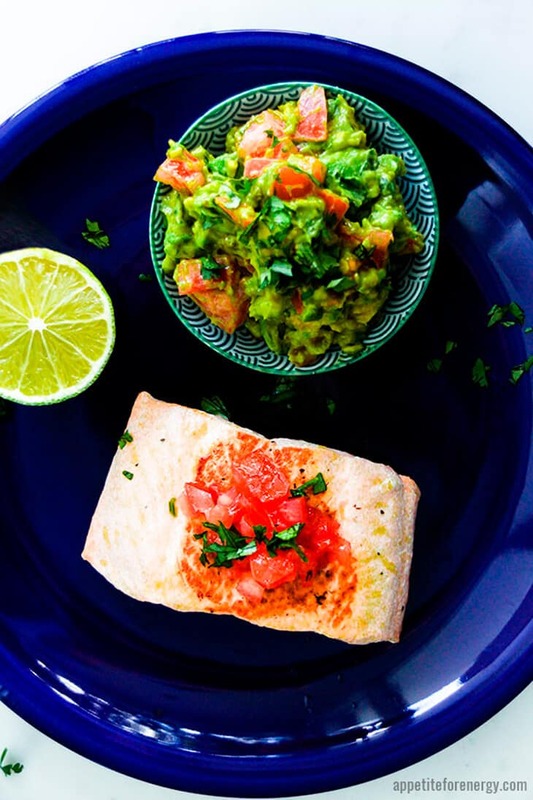 Serve salmon with salsa on top. Add some fresh cilantro to garnish.